When Congress passed the fiscal cliff deal last January, it provided U.S. taxpayers the clarity needed to make lasting, forward-thinking investment plans. As 2013 draws to a close, you may find it worthwhile to review those policy changes and ensure your investment portfolio is as tax-efficient as possible heading into the new year. The alternative minimum tax has been permanently patched and adjusted for inflation, sparing an estimated 28 million Americans from a “second” income tax. Individuals with a Modified Adjusted Gross Income over $200,000 pay a new 3.8% Medicare surcharge on their net investment income. Individuals with a MAGI over $250,000 have seen their personal exemptions and itemized deductions reduced. The estate tax exemption was increased to $5.25 million, and the estate tax rate has been increased to 40%. Many tax relief provisions remain in effect, such as “marriage penalty” relief, the Child Tax Credit, the American Opportunity Tax Credit and the Earned Income Tax Credit. Interest from qualifying municipal bonds remains free of federal income taxes. 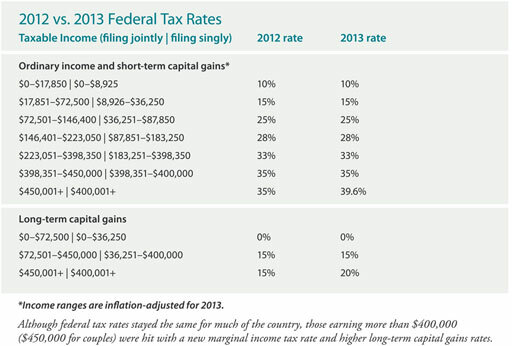 The 0% and 15% long-term capital gain rates remain in place, although a new 20% rate applies to high-income taxpayers. Qualified dividends continue to be taxed at those capital gains rates instead of as ordinary income. If your employer gives you the option, consider converting your 401(k) into a Roth 401(k). Although the amount converted would be taxed at 2013 rates, any subsequent appreciation can be withdrawn tax-free during retirement. Use capital losses to offset capital gains. Remember, wash-sale rules stipulate that if you sell a stock to take a tax loss, you need to wait 30 days before buying the same or a “substantially identical” stock. IRA owners continue to be able to make charitable gifts directly from an IRA and have it count toward their required minimum distributions through 2013. Although taxes should not be the primary driver behind your investment decisions, maximizing your portfolio’s tax efficiency could make a big difference in what you owe Uncle Sam next April. Your financial advisor can work with you and your tax professional to help make sure your portfolio is both tax-smart and in line with your goals.